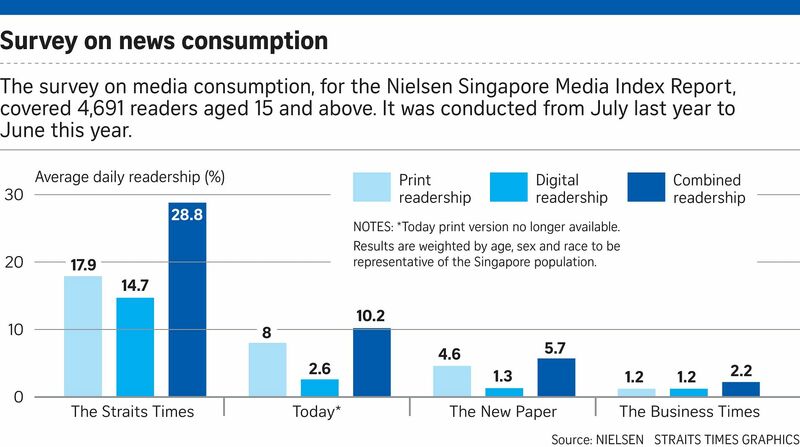 Despite the increasing popularity of online news, print is still read more regularly by Singaporeans. The latest Nielsen Media Index report shows that for more than four in 10 local adults (44.4 per cent), print newspapers continue to be their staple read. One in five (19.5 per cent) turns to digital sources for their daily news fix. Still, the survey of nearly 4,700 people aged 15 and above showed that among online activities such as social networking and instant messaging, news consumption was one of the fastest growing. Around half (52.7 per cent) were accessing online news at least monthly, with about two in three in this group visiting digital news platforms weekly. The Straits Times, meanwhile, has maintained its position as the most-read English newspaper here, with a combined print and digital readership reach of 28.8 per cent on an average daily basis. The print edition of ST, Singapore Press Holdings' (SPH) flagship daily, was read by 17.9 per cent of adults. Its digital version had 14.7 per cent readership, up from 10.4 per cent. "We are glad that The Straits Times remains the best read source of news in English in Singapore," said Mr Warren Fernandez, ST editor and editor-in-chief of SPH's English, Malay and Tamil Media Group. Mediacorp's free sheet Today, which went fully digital last month, had a combined average daily readership of 10.2 per cent, with its print edition, which has now ceased, reaching 8 per cent. Figures for SPH's other English-language papers, The New Paper and The Business Times, were 5.7 per cent and 2.2 per cent respectively. Lianhe Zaobao kept its No. 1 place on the Chinese-language newspaper chart, with a combined daily readership of 14.7 per cent among Chinese readers. Media players here are quick to recognise the global trend towards digital news consumption, said Mr Mimrah Mahmood, Asia-Pacific media solutions regional director at media intelligence firm Meltwater. "For example, consumers today are showing an increasing preference for mobile news and bite-sized or rich digital media, and for both SPH and Mediacorp, they have invested heavily in multimedia stories and optimised mobile applications to engage their audiences," he said. Mr Fernandez said that as more readers shift to consuming news digitally, ST is striving to serve their needs for reliable news and views across platforms. "We plan to keep developing our digital products and packages to keep growing our readership going forward. Watch this space."